The chief of Roman empire identified Kanyakumari as the center of Pearl fishery and also identified Korkai, the place of east Kanyakumari, an emporium of pearl trade. The various villages of Kanyakumari like Bhoothapandy, Kulasekaram and Cholapuram were under different rulers at different period of time. When the power of the chola were declined due to rise of of the venad, they took advantage of situation and established their hold on the district. As there were weak rulers of Venad so as a result there was frequent interference by the British(who was known as cape comorin) whose control was completely established over Venad and continued until 1947. From 1947-1956, it was under the personal rule of Maharaja of Travanvore. in the period 1956-1961 the administration fell in the line of other district of Tamil Nadu. 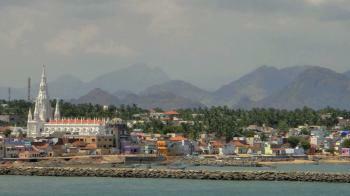 Kanyakumari has been the great center for art and religion for centuries. Kanyakumari become the part of reconstituted Travancore-Cochin State in the year 1949. Marshal Nesamony, father of Kanyakumari district, was an instrumental in the merger of Kanyakumari district with Tamil Nadu in theb year 1946. In Summer the temperature ranges from 22°C to 35°C. In Winter the temperature ranges from 17°C to 34°C. The tourist can visit Kanyakumari between the months October - March. By Air - Trivandrum International Airport is the nearest airport to reach kanyakumari. By Rail - Kanyakumari has its own railhead i.e Kanyakumari Railway Station. By Road - There regular Buses to Kanyakumari from other cities.